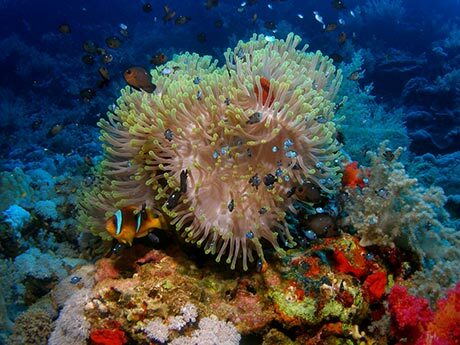 The most common clownfish in the Red Sea, hence its name. But it doesn't just live in the Red Sea. You will also find it in the Gulf of Aden and in the Chagos Islands in the Pacific some 3364 km away. But curiously nowhere in between. 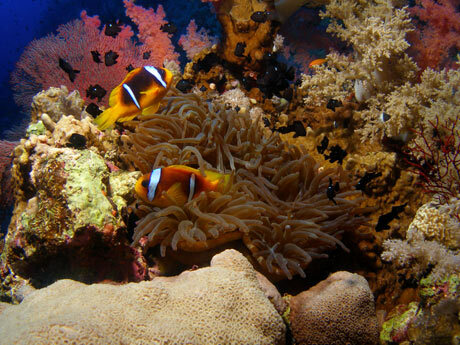 The Red Sea Clownfish lives from the shallows down to 30m, generally in pairs in association with an anemeone. This is a classic example of symbiosis - where two different organisms live in close physical association to the advantage of both. 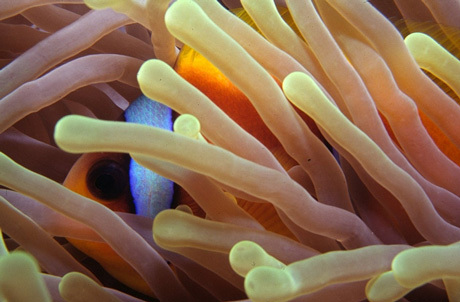 The stinging tentacles of the anemone protect the clownfish from predators. The benefit to the anemone is probably down to the fish's swimming within its tentacles and wafting them around, thus increasing the water flow and hence the amount of oxygen available to the anemone. 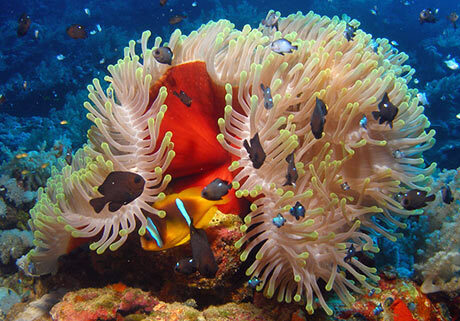 The anemone may also feed on the fish's waste material, plus the fish remove bits of debris from the anemone. 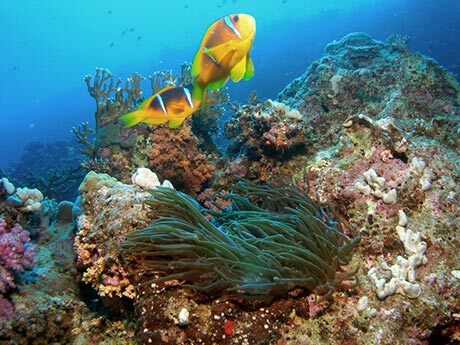 There is also evidence that some clownfish species attack butterfly fish, which would otherwise eat the anemone. That the clownfish are not worried by the anemone's stinging cells (nematocysts) is down to their mucus coating. 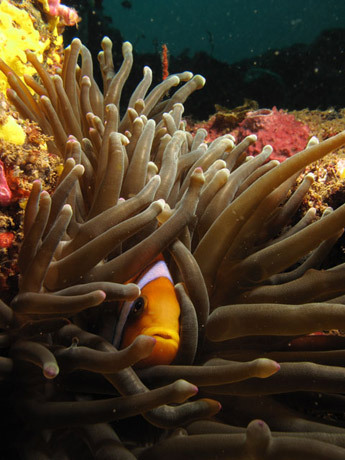 When the clownfish lavae settle in the anemone their mucus coat acquires the anemone's chemical signature, which inhibits the nematocysts from firing. 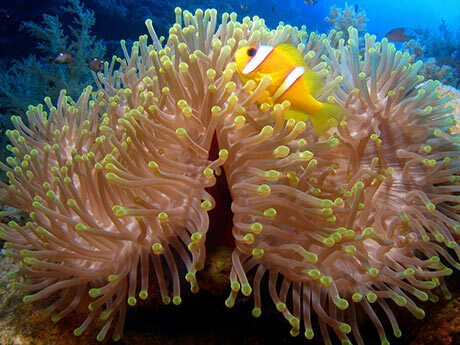 This clownfish favours five types of anemone; other species are more selective. Adults are rarely more than 2 m away from their anemone home. 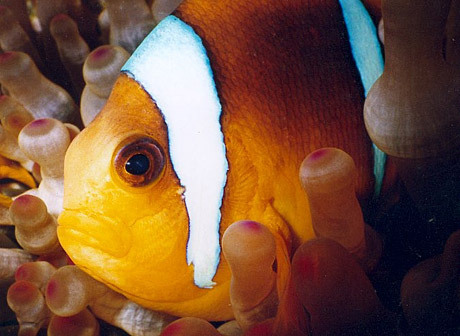 When clownfish have been artificially deprived of their anemone, they often dig holes and feed them, defend them and sleep in them much as they would behave with an anemone. 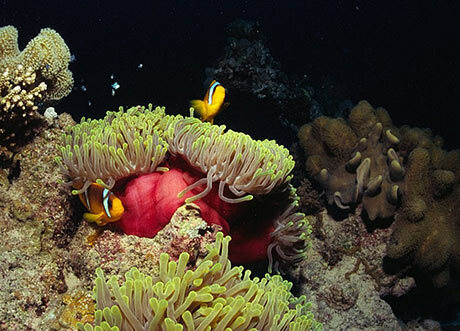 Clownfish in an aquarium have been observed bathing in the air bubbles and defending them, perhaps seeking stimulation comparable to that of the tentacles of the anemone. Clownfish start off male, but if the female dies the dominant male will change into a female. The fish spawn around the full moon and lay 500 to 1500 eggs on a patch of cleared rock near the anemone home. The parent often rubs the anemone causing the tentacle to extend, which in turn forms a protective canopy for the eggs of the fish. The male cares for the eggs, driving away intruders. Even divers have been attacked if they get too close. He blows water over the eggs, giving them oxygen-rich water and preventing fungus from growing over them. After around a week the eggs hatch, usually soon after sunset. The larvae then drift in the current for more than a fortnight before seeking their own anemone. 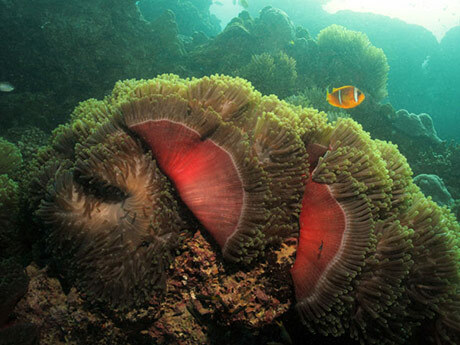 A recent study found that the larvae of a similar species, the Omani clownfish, regularly travelled 400 km - the longest distance scientists have been able to track the dispersal of any coral reef fish. 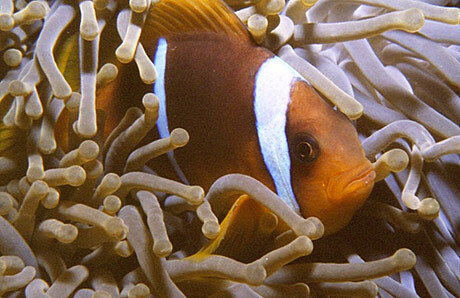 Larval clownfish can smell predators which helps them avoid being eaten as they search for an anemone in which to live. However in raised ocean acidity - which will happen if we fail to curb CO2 emissions - they lose their ability to smell predators. Other experiments have shown that they also lose the ability to smell their anemone hosts. You can identify this clownfish from others as it has no white stripe at the base of its tail; the tail is orange and not black or white and of course by its location. Many have blackish backs but some are pure orange. They grow to 14 cm long. 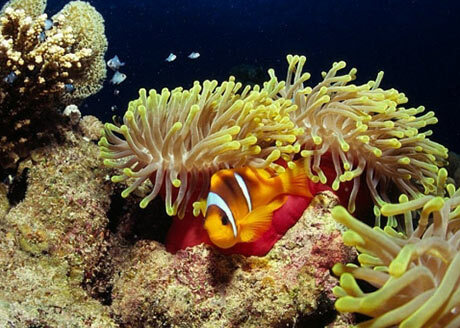 Finding Nemo is real: Clownfish make epic sea journeys, New Scientist 17 September 2014.